One of the best things about working for a local iconic sausage maker is that we get to taste the great sausages we make daily. 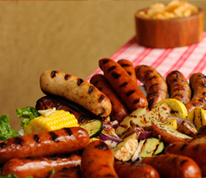 We especially look forward to taste testing new products like our new Wicked hot sausage line. 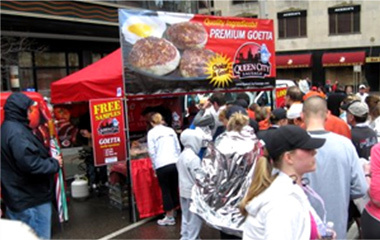 In recent years, I estimate that we have grilled over a quarter million brats, metts, and Goetta Sliders at huge events such as the Heart Mini Marathon, Flying Pig, Komen race for the Cure, and many more. Along the way, we have developed our top 7 Grill Tips and will gladly share with you. Tip #1—Build the Anticipation: Why? Announcing the grill menu to guests builds excitement and engagement. 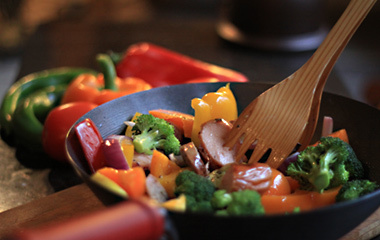 Additionally send out flavor signals from the very beginning by sautéing onions and peppers in Italian dressing. Add a dash or 2 of Worcestershire sauce. Yes, Worcestershire sauce. Liquid magic! The onions and peppers become toppings at the end. Tip #2—Grills are Centerpieces: Focal points. Why? People love to gather around well stocked grills. Mom used to remark that at parties, people always tend to gather in her kitchen. Food unites people. Food is theatre if you let it. Is your grill rushed or celebrated? 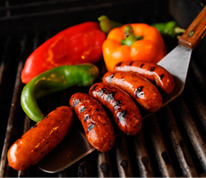 Tip #3—Parboil in Beer: Parboiling in beer accomplishes so much it is likened to “grill magic.” Parboiling with your favorite beer makes grilling more interesting not only to you but your guests too. It is memorable and quite functional. Parboiling preheats the brats and metts evenly. 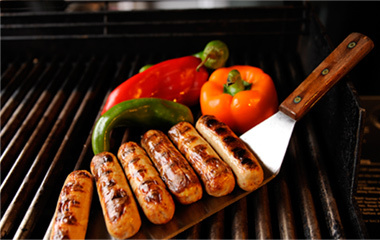 The time on the grill needed for the links is now just to produce a wonderful finish on the sausages. Not cook them from scratch. Especially useful if you have a large crowd. Learned this tip from Oktoberfest Cincinnati food vendors 20 years ago. 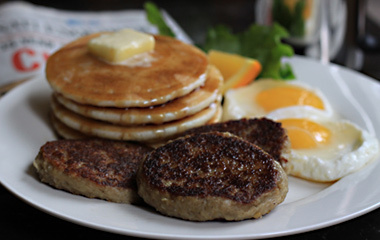 Grill Lab Tip #4 --- Master the Heat: After grilling over a quarter million brats, metts, and Goetta in recent years, a real insight has appeared. It’s the heat! Not so much the source. One reason this can be said is because wood and charcoal are mainly used to impart smoke flavor. Queen City sausages are already slow cooked with hickory wood smoke. Cast iron flat-tops, charcoal, and gas all work very well. Use the grill to finish, not do the heavy lifting. Note: Parboil first. Tip #5 -- Slow Down! : Don’t over cook. Don’t rush the grill or the meal. 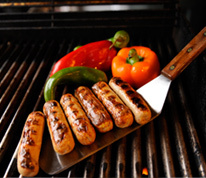 Slow grilling allows the sausages’ natural juices to activate. This results in extrodinary tasting sausages. Slowing down also builds anticipation. Let your guests see what’s cooking. Make grilling fun for you and everyone. Slow down. Take it easy. Tip # 6 – Natural Casing Snap. Why natural casing? 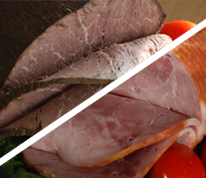 Natural casing holds in the natural juices and flavors of the meat. It’s the old fashioned way. There is nothing like the “Snap” of natural casing sausages. 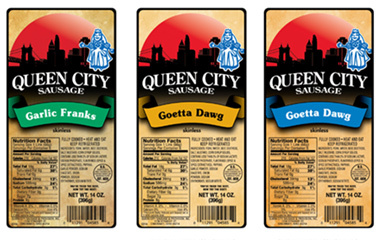 Queen City sausage offers your favorite brats and metts in natural casing and skinless. Delicious! Tip #7 -- Set up a Toppings Bar: Here is the final tip, at least in this series and deals with adding that extra special element that guests of all ages will extremely appreciate. It’s the final step. The finish. The customization: A Toppings Bar. Toppings Bars can be simple. They can be elaborate. Basic Toppings Bars offer: Sautéed onions. Relish. Ground mustard. Ketchup (Reluctantly). Sauerkraut. Salsa. Have fun. Create your own Toppings Bar. 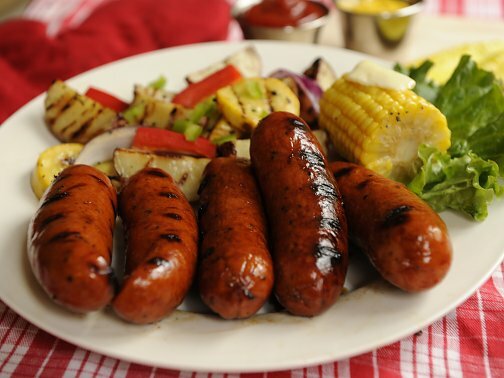 Watch your guests add their twist to your perfectly grilled brats, metts, and hot dogs. 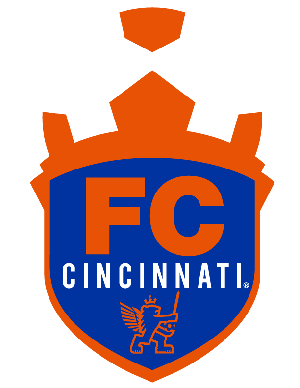 Cincinnati is a city that enjoys its heritage, sausages, traditions, and hometown heroes. Pete Rose, baseball’s all-time hit king is one of those heroes. 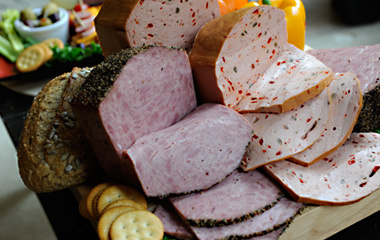 Elmer Hensler, founder and president of local favorite Queen City Sausage is another Cincinnatian who made his mark in this community. It is not often that two Cincinnati icons find the time to meet and enjoy great conversation over lunch. On September 22nd Pete Rose stopped by the Queen City Sausage Factory in Cincinnati. Once there Pete sat down to a casual lunch of Elmer Hensler’ finest sausages. Brats. Metts. 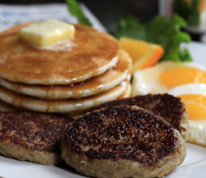 Goetta. Freshly made. Freshly grilled. 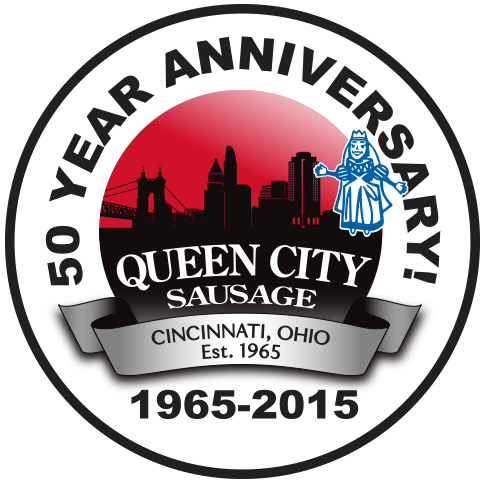 This is Queen City Sausage’s 50 year anniversary. 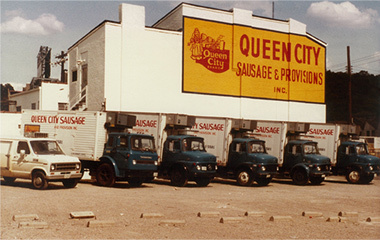 Elmer founded Queen City Sausage in 1965. 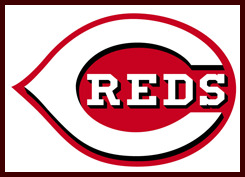 This was a few years after a young Pete Rose was beginning his career with the Cincinnati Reds. Both men have much in common. Both grew out of the West Side of Cincinnati and from humble beginnings. Both told story after story of life back in the day. As is a tradition with Elmer, if you are invited to our daily lunch at Queen City, you are also invited on a personal tour of the sausage factory given by Elmer. Of course Elmer offered the tour and Pete accepted. It was a very good day. 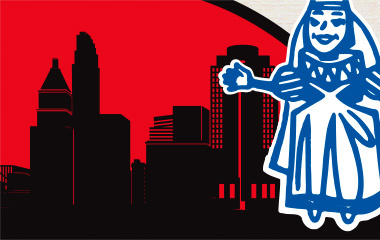 Cincinnati Mayor Cranley to Proclaim May 25th as Queen City Sausage Day! Proclamation to be presented! Elmer Hensler, founder and president reflects on his 50 year past while building an even brighter future. Elmer Hensler is a proud Cincinnatian. He speaks very fondly of growing up in Cincinnati’s West End in the 1930’s. This was the historic meatpacking district and it had a profound impact on Elmer in his youth. Elmer began working in the local slaughterhouse, just up the street from his home. He was 11 years old. “I just showed up at the slaughterhouse doing odd jobs hoping they would hire me.” Elmer reflects. He did this before grade school by rising at 4:00 a.m.
By 1965, Elmer, along with two partners, started Queen City Sausage. They pulled together $13,000. Elmer likes to reflect on several things; Queen City Sausage is the last independent standing after over 40 meat companies, including Kahn’s went out of business in Cincinnati since he started. Additionally the company has always made a profit, and is now adding on a 14,000 sq. ft. addition. The 12th since 1965. 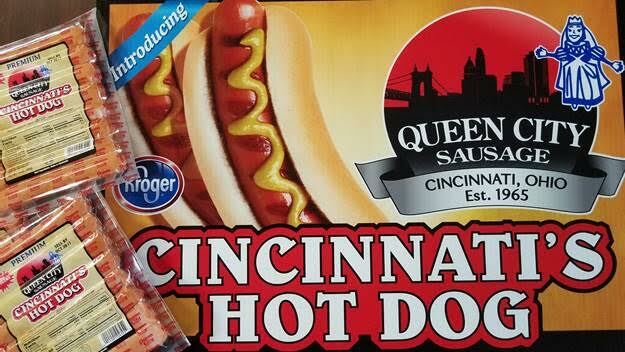 Not only is 2015 the 50th anniversary for Queen City Sausage it also marks a milestone for the company by expanding into additional Kroger markets outside of Cincinnati including all of Ohio, Indiana, and parts of Michigan and Illinois. The company is also the official sausage of the Reds and Bengals. Elmer lives by two mottos; “Never cheapen your product” and “I don’t want to be the biggest, just the best.” 50 years is a long time to be in business. Elmer’s mottos have served him well! 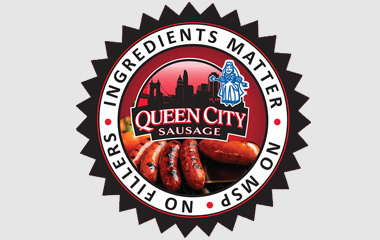 Elmer Hensler will be presented the proclamation at City Hall, Wednesday, May 20th at 2:00 p.m..
Queen City Sausage and Provision, Inc. was founded 1965 by Elmer Hensler. 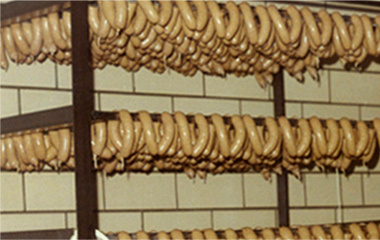 Authentic, German crafted sausage making is a hallmark of the company. The company is located in Cincinnati, Ohio, privately owned and remains in the Hensler family. 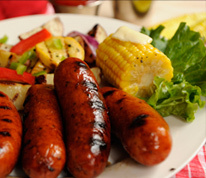 Queen City brats and metts are the best-selling sausages in the region. 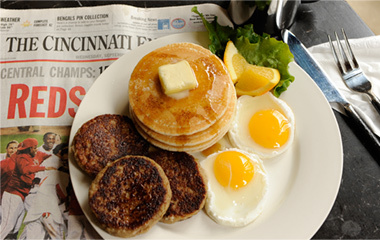 Queen City Sausage and Provision, Inc. 1136 Straight Street, Cincinnati, OH 45214. Contact: Mark Balasa/Director of Marketing/513/541-5581. Elmer Hensler is a story teller. 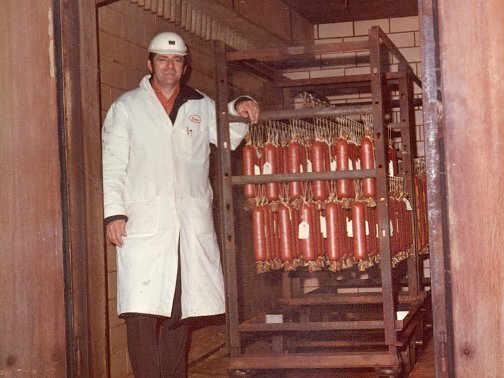 He often invites people to tour the Queen City Sausage Factory and conducts most of the tours himself. While on the tour Elmer narrates how and where the company began in each of the 11 expansions you walk through while there. Each room has a story, a unique need that it satisfied and where the company was at the time on its road to success. The tour begins with a walk on the roof on the way to Jeff’s Cooler. While on the roof, the visitor gets a very strong blast of freshly burning hickory wood smoke emanating from the smokehouses. The smell is primal! It fills up the senses. It makes you hungry! Once inside Jeff’s Cooler, a full array of large containers of fresh meats are on display. Some of the meat arrived that morning and some has been freshly blended for various brat and mett recipes. The emphasis is on fresh here. No meat is ever purchased that has been previously frozen. Buying fresh meat costs much more but Elmer insists on being able to test the quality instantly of all meat arriving at the plant. Along the tour route, the various production processes are shown. This includes mixing, chopping, stuffing, steaming and the favorite, smoking! Elmer explains every aspect. He is so proud! Most tour visitors walk away with these thoughts: Wow! “I had no idea how great sausage is really made! How clean and organized the plant is! 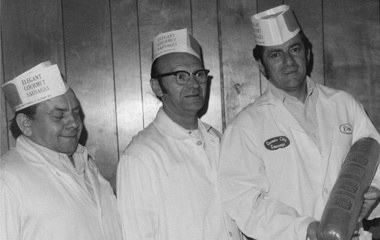 The employees interact so well and know their jobs.” Additionally they can say that they were personally lead on a tour by the Sausage King himself, Elmer Hensler. Elmer is somewhat unique in that he has never forgotten where he came from. Cincinnati’s West End. The original meat packing district of Porkopolis. Humble beginnings and poor. So everything gained is appreciated. Everything! That’s Elmer! 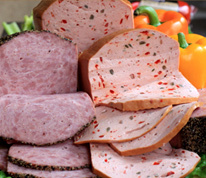 When most business owners achieve the success Elmer J. Hensler has with his now over 50 year old Queen City Sausage Company, they tend to want to slow down a bit. Not so for Elmer. In fact, construction is underway for his 12th addition to the sausage factory. 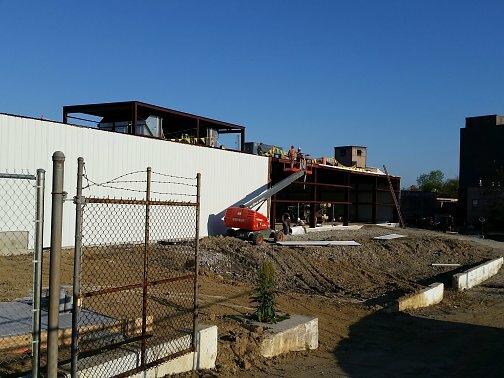 This new addition will not only add needed space, but will also streamline the production process. This is especially important and timely as the company is looking to expand into surrounding areas such as Columbus, Indianapolis, Michigan, Louisville, and Lexington. 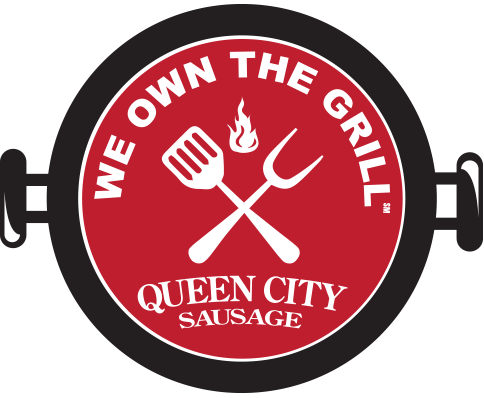 As Elmer often proclaims; “We do not want to be the biggest, just the best!” This phrase sums up the careful approach the Queen City Sausage team takes when considering a gentle push outward. “I do not want to make any kind of move that will jeopardize the quality of our sausages for our existing customers.” said Elmer. So everything is carefully calculated and lined up, including any new production equipment. Regional expansion is now underway. Additionally, Elmer often reflects on the team he has in place. Patrick Miller is the GM/Director of Sales, Mark Rodgers is the Plant Manager, Mark Balasa is the Director of Marketing, Edie Glenn is the Office Manager, and Sandy Witt is the inside Sales Manager. There are many other key players, most with great longevity. There is very little turn over.